Editorial (A. Szentivanyi, I. Berczi). Preface (I. Berczi, R.M. Gorczynski). I. Introduction. /inca/publications/misc/622009intro.pdfNeuroimmune Biology - An introduction (PDF) (I. Berczi). Studies on the hypothalamic regulation of histamine synthesis (A. Szentivanyi, I. Berczi, D. Pitak, A. Goldman). II. Neuroimmune Regulatory Mechanisms. Introduction: II. Neuroimmune regulatory (R.M. Gorczynski). Dynamics of immune responses: historical perspectives in our understanding of immune regulation (K.T. HayGlass). Cell-to-cell interaction and signaling within the immune system: Towards integrating mechanism and physiology (P.A. Bretscher, N. Ismail, N. Peters, J. Uzonna). Regulation of the immune response within the central nervous system (J. Antel). Regulatory circuits of the pituitary gland (L. Stefaneanu). Neuroendocrine stress and inflammatory disease: from animal model to human disease (E.M. Sternberg, M. Moghaddam). Immunoregulation by the sympathetic nervous system (D.M. Nance, B.J. MacNeil). Behavioral and central neurochemical consequences of cytokine challenge: relationship to stressors (Z. Merali, H. Anisman, S. Hayley). Proinflammatory signal transduction pathways in the CNS during systemic immune response (S. Rivest, S. Nadeau, S. Lacroix, N. Laflamme). Nitric oxide in neuroimmune feedback signaling (T.L. Krukoff, W.W. Yang). III. Neuroimmune Mechanisms in Physiology. Introduction: III. Neuroimmune mechanisms in physiology (R.M Gorczynski). A model of neuroimmune communication: Mast cells and nerves (J. Bienenstock). Immunomodulation by the submandibular gland (A.D. Befus, P. Forsythe, R.E. Déry, R. Mathison, J.S. Davison). Glandular kallikrein in immunoregulation (E. Sabbadini, E. Nagy, A. Vörös, F.T. Kisil, I. Berczi). Understanding classical conditioning of immune responses (R.M. Gorczynski). Sleep, health and immunocompetence (H. Moldofsky, Wah-Ping Luk, J. Dickstein). Interactions between the immune system and the testis (D.K. Pomerantz). Leptin and cytokines: Actions and interactions in fever and appetite control (G.N. Luheshi). IV. Neuroimmune Host Defence. Introduction: IV. Neuroimmune host defence (R.M. Gorczynski). Fever and antipyresis (Q.J. Pittman, A. Mouihate, M.-S. Clerget). The salivary gland peptides: Their role in anaphylaxis and lipopolysaccharide (LPS)-induced inflammation (J.S. Davison, D. Befus, R. Mathison). Olfactory stimuli and allo-recognition (M.G. Baines). Natural immune regulation of activated cells (D.A. Chow, R. Kraut, Xiaowei Wang). V. Neuroimmune Pathology. Introduction: V. Neuroimmune pathology (I. Berczi). Stress, health and the immune response: Reciprocal interactions between the nervous and immune systems (A.W. Kusnecov, A. Rossi-George, S. Siegel). Cytokines in the brain: From localization and function to clinical implications (J. Licinio, Ma-Li Wong). Neurogenic inflammation: Role of substance P (A.M. Stanisz). Lupus as a model of neuroimmune interactions (J.A. Denburg, B. Sakic, H. Szechtman, S.D. Denburg). The pathogenesis of encephalitis (T. Owens, E. H. Tran, M. Hassan-Zahraee, A. Babcock, M.L. Krakowski, S. Fournier, M.B. Jensen, B. Finsen). VI. Clinical Neuroimmune Biology. Introduction: VI. Clinical neuroimmune biology (I. Berczi). Growth hormone therapy and immune function (R. Rapaport, R. Moghaddas). The role of prolactin in systemic lupus erythematosus (R. Warrington, T. McCarthy, E. Nagy, K. Lee, I. Berczi). Combination immunotherapy of cancer (E. Nagy, I. Berczi, E. Baral, J. Kellen). The influence of reproductive hormones on asthma (G.T. Ford, C.L. Bjornson, I. Mitchell, M.S. Rose). Neuro-immunopathgenesis in autism (V.K. Singh). Skin inflammation and immunity after spinal cord injury (B.J. MacNeil, D.M. Nance). A new scientific discipline, acknowledged 65 years after its discovery, was the focus of the first Conference on Neuroimmune Biology in Canada. The papers presented at the conference, and in this volume, are dedicated to Dr. Hans Selye who is recognized as discovering the existence of a hypothalamic-pituitary-adrenal-thymus axis. This axis plays an important role in the adaptation of higher animals and man to various physical, chemical, biological and emotional challenges. The conference and participants also honored Dr. Andor Szentivanyi whose opening paper, "Studies on the hypothalamic regulation of histamine synthesis", is contained in the introduction to this book. Dr. Szentivanyi has dedicated his long research career to the clarification of the role of the central nervous system in immune and inflammatory reactions, and his experimental results are presented here. 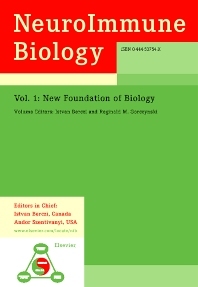 With an ultimate goal to achieve a more thorough understanding of higher organisms in their entire complexity, this book, the first in the series http://serval.elsevier.com/locate/series/nibNeuroImmune Biology presents a coordinated and integrated view of the growing body of knowledge rapidly accumulating in this area.